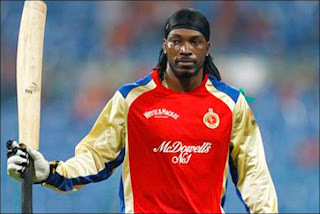 West Indies Cricketer Chris Gayle who is playing for Royal Challengers Bangalore in Indian Premier League was on fire on Tuesday when he scored 175 runs on just 66 balls against Pune Warriors in a T20 match. Chris Gayle reached 100 on just 30 balls. 175 runs is the highest score by a Batsman in a T20 match. Gayle's hundred on 30 balls is also a new record in T20 Cricket. He hit 17 sixes and 14 boundaries in his awesome inning. It was one of the best Batting inning i ever seen in Cricket history.